This is he quilt my sis made for her friend, Linda, as a part of an exchange. The name is obviously a take-off of the quilt name “Streak of Lightning” which is similar to what my sis did on her quilt she made as a gift a couple of years ago. The color starts in one color and heads downward in a streak like movement. Here is my sis’s. My pocket one is actually quite a bit simpler than the one my sis made, but the “idea” is the same. I found that even after making the top Pick a Pocket, I still had over 80 pockets left. I knew I needed to make one more pocket quilt top. So I did. They were taking up too much room in plastic tubs!!! My heart wasn’t into anything complex, though - I had recently finished the other one which actually took quite a while. So, I thought of this simple idea. My biggest question was, “Do I have 56 pockets that are small enough? So I went with gray. I barely had enough of one or two of the shades, but I made it work. All I did for this one was choose 7 “shades” of gray/black/white (off white) and make 8 blocks of each of these border colors. I then laid it out in the manner shown. I decided it doesn’t really need a pattern. Just read what I did here. The blocks are 12.5” square before being sewn into the quilt. They look like like this. I cut the pockets 6.5” square - trying to center them, though that wasn’t always possible. And, I didn’t sweat it. I only eyeballed the whole thing. If it wasn’t quite centered, well, that’s part of the charm of it all. I cut out 2 - 3.5”x6.5” pieces of gray/black/white for the sides of the pocket and 2 - 3.5”x12.5” strips for the top and bottom. I sewed first the side pieces and then the top and bottom. And that’s it. 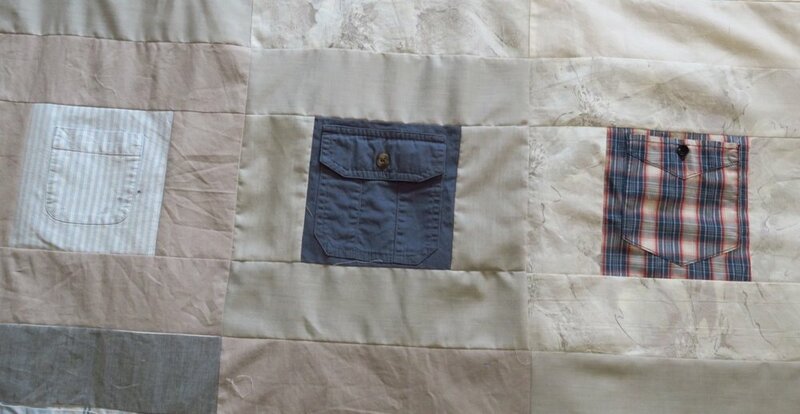 The border was simply a 3” piece of white - the same as the white pocket squares - just so the blocks could “float” a bit. Here’s the layout I used. The “streak” is obvious, right? It’s a very simple quilt. A simple design. Am I delighted with it? It’s “okay”. I’ll like it better after it is quilted. But I am THRILLED that I used up the majority of my pockets. The rest may go into the drawer with other pockets of other colors - which I can incorporate at least a few into my planned “fidget quilts”. I’ve been collecting things to make some of those, too. I really have more ideas than time! I’m pretty sure that the middle gray is a poly/cotton mix. It doesn’t want to press as well - but after I quilt it, all will be fine! As you read this, I’ll be either getting ready to try to give out the majority of the rest of the children’s quilts or it will be going on, or it will be over. We’ll see how turnout goes. I made up about 30 new coupons and put them at the social services office on Monday afternoon. So, I’ll see if people show up to take some home! It’s right at the end of their winter break, and I thought it might be a fun way to celebrate for those who saw the quilt give-away!